With CD Burner you can create your own custom music CDs that can be played in any standard home or car stereo. With Audio CD Burner, you can choose to burn 74 or 80-minute audio CDs on either 74 or 80-minute CD-R/RW discs. 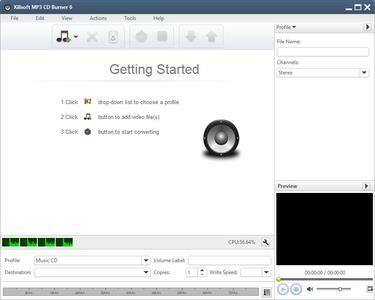 Just drag and drop the songs you want onto the main screen, hit the record button, and in a short time you will have a custom CD! Audio CD Burner work with most popular audio formats: MPEG Layer 3 (MP3), Ogg Vorbis (OGG), Windows Media (WMA) and WAV. There is no need to convert to WAV! Your CD is burned directly saving your hard drive space. Audio CD Burner supports majority of IDE CD-RW drives assembled in 2001 year or later, if its burn speed is more than 8x.